It has been all about salads for me this summer. Salads are just so healthy and fresh. Aren’t they? I really have pushed my self to try out new flavors this year and it is really making my food more interesting. I have tried strawberries with balsamic vinegar n basil, watermelon with red pepper flakes etc…and so far I am really enjoying it. But using a Peach in salad was totally different to me. I was just not sure with the combination of vinegar, pepper n peaches. But it worked just fine like other salads did. And now this salad has made it to the “One of my favorite” list. I also LOVE goat cheese and walnut is my favorite nut ;). So I thought to add both of these in to my salad to give it crunchy and creamy texture. And believe me, it is delicious! 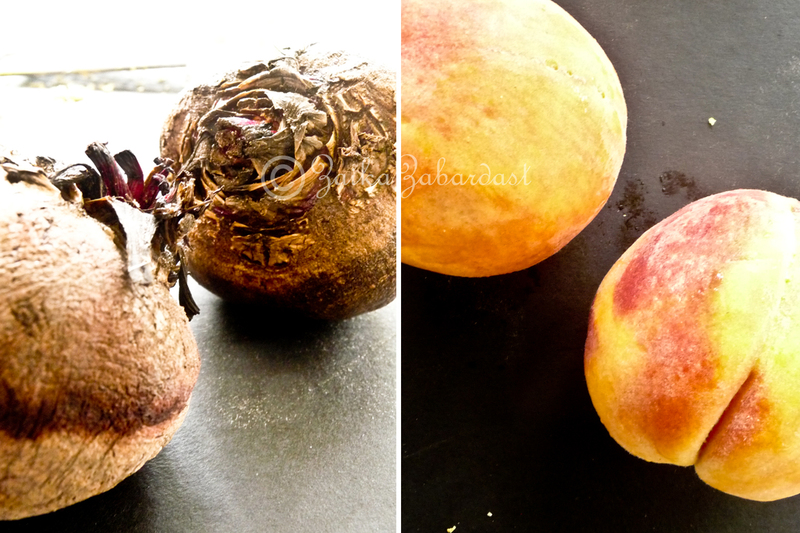 A note for using beetroots; I have tried both the roasting method and microwave method. Both of them really worked for me. So if you have time and if you really want to enjoy the juicy flavors of beetroots then I would suggest you go for the roasting method. 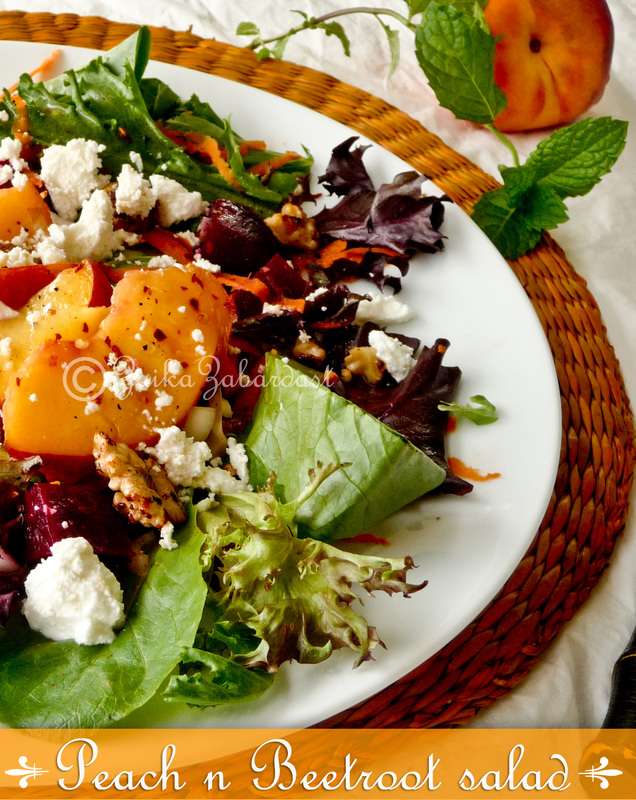 But if you are in a hurry and you still want to enjoy the salad, just use microwave method. It works just fine. SO here you go! 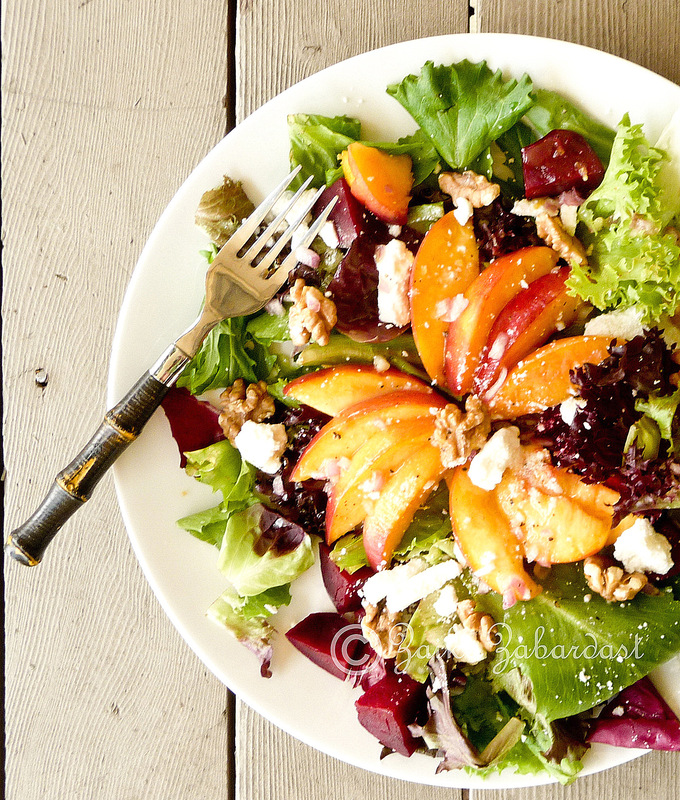 To make the salad, in a serving plate or in a salad bowl combine the mixed spring greens, sliced peaches and diced beets. Then serve immediately with some goat cheese crumbles and roasted walnuts on the top. Pre-heat the oven to 350 degree F. Remove beet greens and wash the beet roots well. Place beets onto an aluminium foil on a baking tray first. Then lightly rub beet skins with olive oil. My beets were kind of small so I roasted them all together. But if you want you can roast all separately. Cover the beets and make small hole in the middle for air to come out. Now bake the covered beets for about an hour or more. 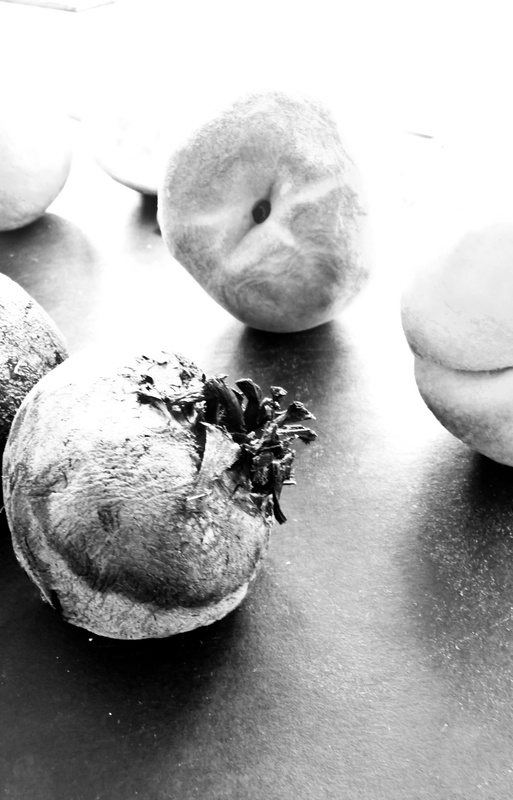 When beets are done, allow them to cool and peel of the skin. Trim the ends and dice it to desired size. Refrigerate until ready to use. Toss it into your salad and enjoy! Remove beet greens and wash the beet roots well. Put 2 beet roots in microwave and microwave it on high for 5 minutes. Once done, leave it out on counter for another 5 minutes to cool down and peel the skin off with vegetable peeler. Also slice about 1/4″ from both the ends. Dice is to desired size and toss it in your salad! Very interesting combination of ingredients for the salad. Salad looks delicious. Awesome clicks. 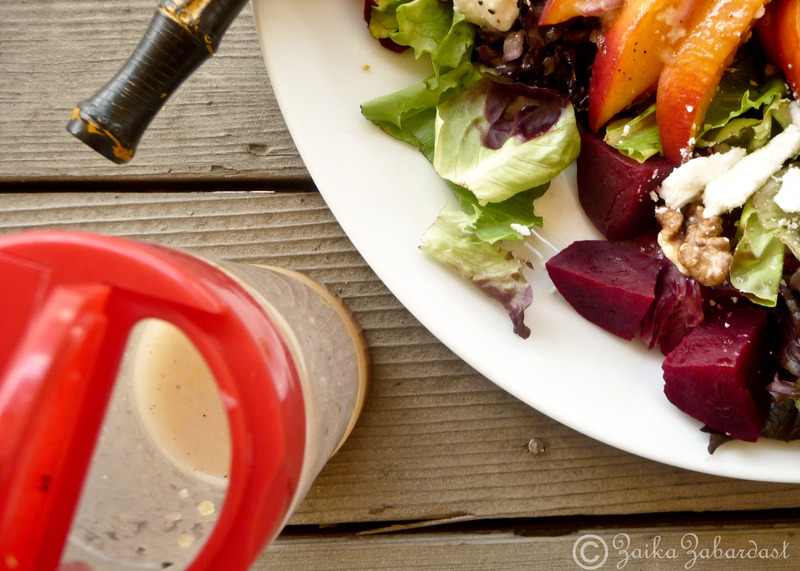 I too enjoy peaches on salad and there is one similar kinda salad in my blog 🙂 Should try your version too! Love the clicks!